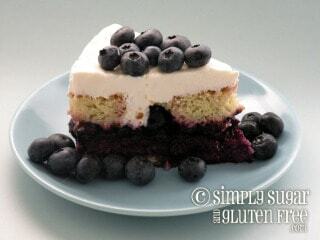 Photo of BlueberryTiramisu from Simply Sugar & Gluten-Free. Eating healthier is the latest buzz. And it’s not just because summer is here and we all want to look great in a bathing suit. With Jamie Oliver’s Food Revolution sweeping worldwide and America’s increasing obesity problems, it’s clear that there is a need to eat healthier. I know how it feels to be labeled obese. At 5’ 5” I tipped the scale at more than 180 pounds. With some basic changes to how I eat and live, I’ve been able to maintain a 60+ pound weight loss. I couldn’t be more grateful. Healthier food has a bad rap. Maybe rightly so. We’ve all had the low-fat, no-fat, low calorie, tasteless ‘health’ food that left us unsatisfied and disheartened. And who among us hasn’t starved on a diet? There is another way to look at eating healthier. 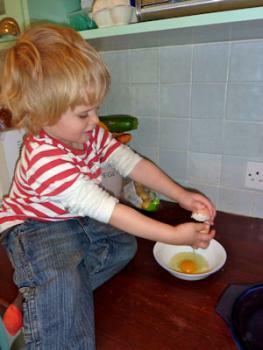 Here are my top tips for making my kitchen creations not only healthier but delicious. 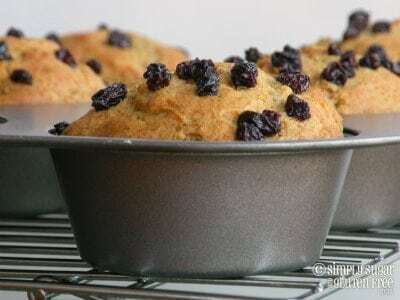 Get your fruits and veggies in your baked goods. Adding nutrients with spinach, zucchini, avocado, blueberries, raspberries, and apples. Lauren of Celiac Teen has a tasty Chocolate Chip Raspberry Muffin recipe you’ll like or try my Blueberry Tiramisu. These tiny seeds are good sources of omega-3 fatty acids, nutrients, and dietary fiber. 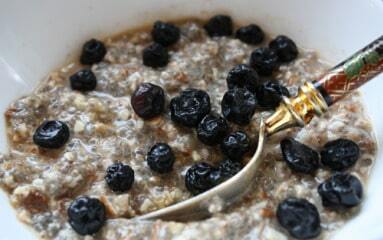 Flax meal can be used as an egg replacer, too, for those that are sensitive to eggs. Try Winnie’s Healthy Green Kitchen recipe for Breakfast Chai Pudding or my Chunky Banana Flax Muffins. I love my sweets, but too much sugar isn’t good for anyone. I can’t eat white sugar so I use alternatives, such as palm sugar, agave, or stevia. For many recipes, I reduce the sugar by half. Instead, add ¼ teaspoon liquid stevia for each ¼ cup of sugar. My Chocolate Teff Cake recipe uses stevia to boost flavor. 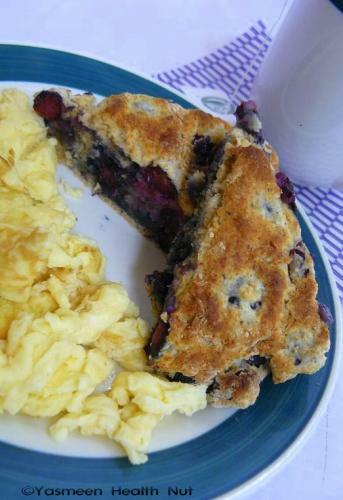 Or, try these nutrient dense Healthy Blueberry Scones with agave from Yasmeen at Health Nut. 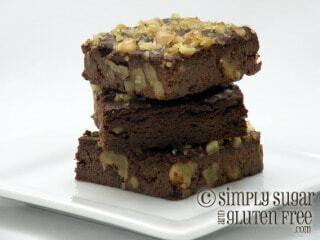 Everyone does a double-take when I tell them they’re eating brownies made with black beans. Beans are a great source of fiber and phytochemicals. In the cooking classes I teach, my students are often a little nervous to bite into one. But, once they take a bite they quibble over who’s taking home the leftovers. Notice I didn’t say no fat. Fat helps us to feel full and causes our food to be digested slower. And, I refuse to give up butter. 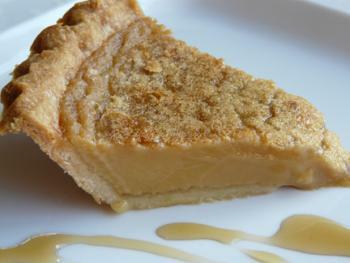 But I do often use unsweetened applesauce or yogurt to reduce the overall fat content. This usually results in cookie or brownie with a cakier texture. Other options include light sour cream, pumpkin or squash purees, and prune or date purees. 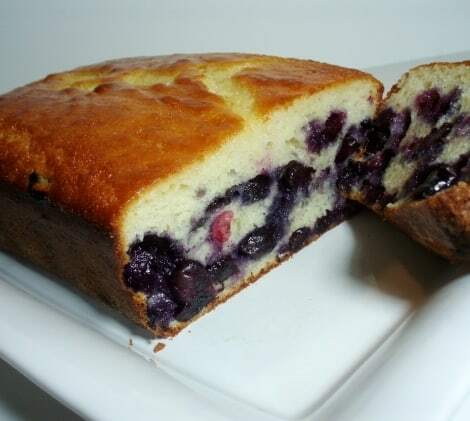 Alta from Tasty Eats at Home successfully replaced whole fat greek yogurt with the fat free version in her Lemon Blueberry Yogurt Cake. By toasting nuts before hand, you can increase the flavor and decrease the total amount used. Nuts are full of great nutrition but they’re also calorie dense. Moderation is key, so this allows you to get just as much flavor without as many calories. Get creative. Rethink some of your favorite recipes – instead of adding more sugar how can you get more flavor into the dish? Fresh herbs like mint, basil, and lavender add depth and interest to cookies, breads, and chocolate. Dried fruits such as raisins, dates, blueberries, and juice sweetened cranberries add nutrition and enhance sweetness instead of empty calories. Start with this recipe for Lavender and Vanilla Macaroons from Healthy. Delicious. Try 2% milk, Neufchatel, or ‘light’ cream cheese, 2% cottage cheese, and part-skim ricotta instead of their full-fat counterparts. The difference is usually not noticable, like in this Baked Quinoa Pudding that uses 1% milk. Whole grains add fiber and nutrients. Even if you don’t need to be gluten-free, try adding one of the whole grain flours to your usual baking flour. Teff, quinoa, amaranth, oat, garbanzo bean, and garfava bean flours are all nutrient dense and add great flavor to baked goods. Find some inspiration with Spicy Whole Wheat Molasses Cookies from Anna at unsweetened cocoa or my Orange Quinoa Muffins with Currants. Maybe you don’t want to give up butter or your frosting is what makes the cake one of a kind. Leave it alone. Change the parts of the recipe that can be altered without comprising the integrity of your final product. Notice that I’ve never mentioned perfectly healthy – instead I focus on eating healthier. There is no perfect, only progress. Pick the one tip that feels the most doable and start making progress toward healthier baked goods in your kitchen today.